A global rally by students landed on the doorstep of high schools in Newfoundland and Labrador Friday. St. John's students joined a global protest Friday, meeting near the Memorial University clock tower before making their way to the Confederation Building to voice their concerns about climate change and call for government action to slow its advance. 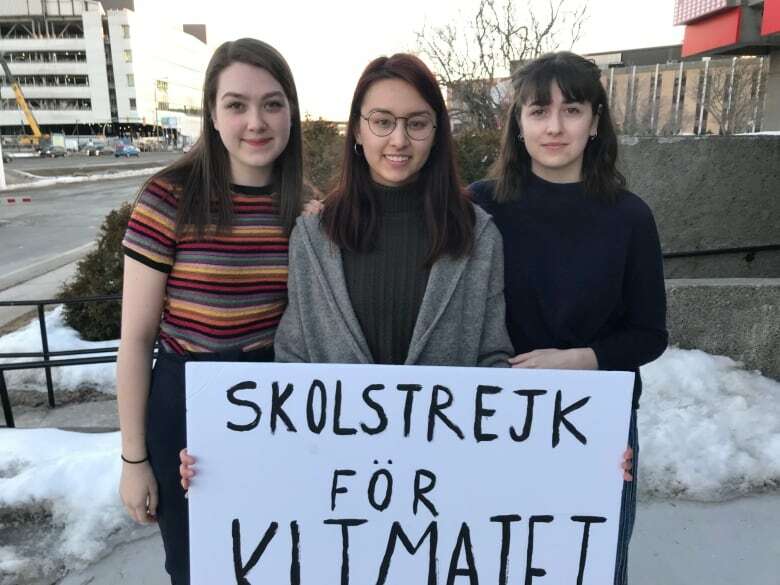 The event is expected to draw hundreds of students from the city's high schools, joining the more than 1,300 other schools from more than 100 countries in the School Strike for Climate Change, a movement that Swedish 16-year-old Greta Thunberg began in August. "It's important for us, obviously, to have more people our age involved, seeing as it's us who are going to be dealing with this issue in the future," said Chloe Puddister, a co-organizer for the St. John's student march. "I think people our age are getting more and more invested in this." The protests are not school-sanctioned events but Allison Jeon, another co-organizer of the St. John's march, told CBC Radio's St. John's Morning Show that most staff at Holy Heart of Mary have been positive. "They can't really support us walking out of school, we definitely understand that," Jeon said. "But for the most part, everyone we've spoken to thinks it's a good cause." Federal members of parliament, city councillors and climate activists made appearances at the protest. Rowan White was one of the several speakers at the rally. The indigenous Grade 12 student said she doesn't think politicians are paying attention but if students keep their protest efforts up, they won't have a choice. "As long as we keep raising our voice and keep putting these pressures on the government ... they have to listen," White said. Maren Duffie is only in Grade 10, but she's thinking about how the climate will affect her future. Holding a sign that said "Make the world Greta again," in support of the 16-year-old Swedish activist behind the movement, Duffie said it's scary to imagine the world in 12 years. "I'll be 27 ... That will be like the prime time of my life. I want a future that is sustainable for my kids and my grandkids, and that starts now with numbers and people coming out and showing the government we need change." It's detrimental to sweep the issue of climate change under the rug, said Erin Lee, a third co-organizer of the local march. Lee said awareness of climate change is crucial, and spreading the word to those who don't believe in it, or those who disagree with the level of risk, is important. "Inevitably, we are going to start to see these consequences. So at this point all of the smaller things are making somewhat of a difference, but at this point it's the big action that needs to take place," she said. "That's why we as youth now, we're not going to back down."